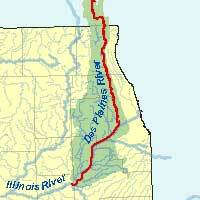 The ancient Des Plaines River ran down from southeast Wisconsin between two glacial moraines to about Riverside on Chicago’s southwest side. From there it cut the current bed of the South Branch of the Chicago River as it ran northeast to Lake Michigan. As the water levels in Lake Michigan dropped, a high spot in the riverbed cut the Des Plaines off from its outlet to the Lake. The river backed up and created a marsh (later called Mud Lake), and spilled into the old Chicago Outlet Valley where it ran down to the Illinois River, finding a new path down to the sea. But now, instead of running through the Great Lakes to the Atlantic, it flows through the Illinois and Mississippi Rivers to the Gulf of Mexico. This then is the beginning of the Chicago Portage. Here at the southwest corner of Lake Michigan the shortest connection between the Great Lakes and the Mississippi watersheds is formed as one of the last acts of the last glacier.